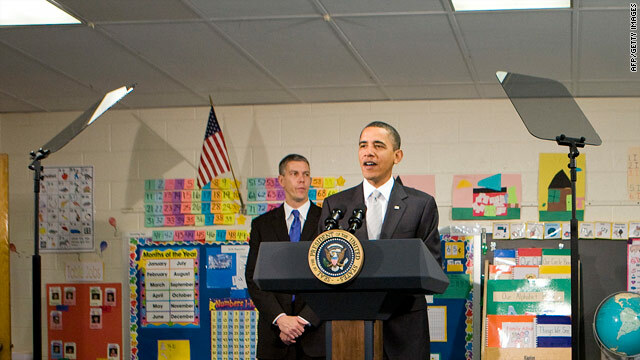 President Obama requests more stimulus money for education at a school in Falls Church, Virginia, on January 19. A CNN/Opinion Research Corporation survey released Monday morning also indicates that 63 percent of the public thinks that projects in the plan were included for purely political reasons and will have no economic benefit, with 36 percent saying those projects will benefit the economy. Twenty-one percent of people questioned in the poll say nearly all the money in the stimulus has been wasted, with 24 percent feeling that most money has been wasted and an additional 29 percent saying that about half has been wasted. Twenty-one percent say only a little has been wasted and 4 percent think that no stimulus dollars have been wasted. "One reason why the economic stimulus bill is no longer popular with the American public is the perception that a lot of the money has been wasted. Six in 10 believe that the projects in the stimulus bill were included for purely political reasons," said CNN Polling Director Keating Holland. "Nearly three-quarters believe that at least half the stimulus money spent so far has been wasted, and one in five say nearly all of it has been a waste," Holland said. According to a CNN poll released Sunday, 56 percent of the public opposes the stimulus, with 42 percent supportive of the plan. Last March, just weeks after the stimulus bill was signed into law by President Obama, a CNN survey indicated that 54 percent supported the program, with 44 percent opposed. The program, formally known as the American Recovery and Reinvestment Act of 2009, attempts to stimulate the country's economy by increasing federal spending and cutting taxes at a total cost to the government of $787 billion. No Republicans in the House of Representatives and only three in the Senate voted in favor of the bill. The CNN/Opinion Research Corporation poll was conducted January 8-10, with 1,021 adult Americans questioned by telephone. The survey's sampling error is plus or minus 3 percentage points.